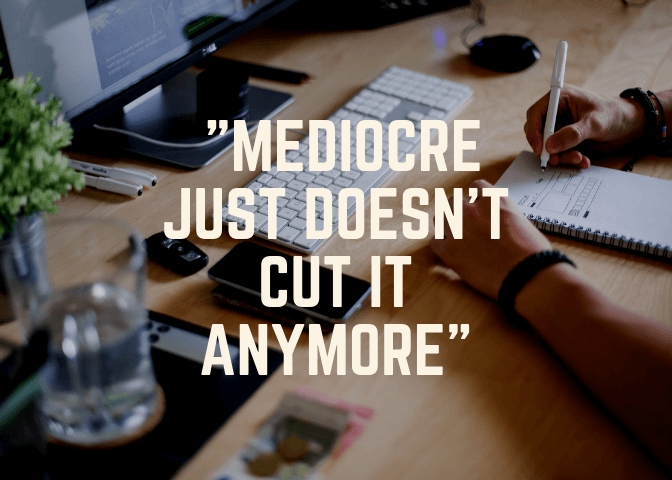 Mediocre Just Doesn't Cut It Anymore. Never Settle for Average. As inventory continues to grow, interest rates rise, and we approach a more normalized market, mediocre just doesn’t cut it anymore. There has been and always will be a difference between working with a real estate agent and working with a real estate professional. The difference isn’t in a title, designation, award, company, or even career length. While some of these factors are important, it doesn’t make someone a professional. "Let's be honest - real estate agents don't have the best reputation. Have you ever thought about why that is?" What sets real estate professionals apart is how they handle the current day to day market conditions, look out for their clients’ best interest, only put out the highest quality marketing, and use the tools around them to deliver the best possible outcomes. Real estate professionals are no different then professionals in any other field. Their job is to fill a need, fix problems and be a guide through a process that is stressful. So why are they so misunderstood? Let’s be honest – real estate agents don’t have the best reputation. Have you ever thought about why that is? "I think about it all the time because it has always bothered me. I value the relationships with my clients, I treasure the referrals I receive, and I appreciate the friends I make along the way." Find out what we do that set's us apart from the average real estate agent. Is the issue the ease of the licensing process? The lack of requirements to obtain a license? The fact that you can get a license to sell real estate in half the time it takes to get a cosmetology license? Is it because real estate is most people’s fall back career? I definitely think the licensing process should be revised and they should increase the requirements needed, but I don’t think that is the issue. In my opinion, I think the average real estate agent loses sight of what is important, and ultimately, what they get paid to do. Agents often forget to listen and do too much talking (as I write this long blog. Ironic?). Real estate professionals have a fiduciary responsibility to their clients to act on their best interests and be a guide through the process. They have a responsibility to listen to their client, find out their goals, and help them achieve it in the best possible way. Instead, they focus on selling, rather than acting as a consultant. They often want things done as soon as possible versus working on their clients’ timeline. This mentality is the biggest flaw in, what could possibly be, one of the best industries. Search property in San Diego here! My team and I strive to be the best we can. We are human. We aren’t perfect. We make mistakes. Sometimes we juggle too much and drop the ball, but we are always working to be better. We work on listening more, consistently learning, looking out for our clients’ best interests and always staying one step ahead of the curve. We are professionals. "My team and I strive to be the best we can. We are human. We aren't perfect. We make mistakes."